As a personal trainer, that has been the most encouraging thing to me. I don’t beat myself up when I do make mistakes. It removes the pressure to always be perfect. The workouts are always fresh and new. I can tell each one of you spends time putting together quality workouts for us ladies. Lastly, I just love the women’s fitness community. It’s much needed and greatly appreciated. The ladies are encouraging and willing to speak truth when some of us need to hear truth, even when we don’t want to hear it, we need it to keep us moving forward. Again, as a trainer, and now as a new women’s only fitness gym owner, you ladies are mentors to me, even though I have never met some of you. So, thank you for pouring into our lives! I lost 40lbs between pic 1 and pic 2. Thanks so much for letting me share my story. 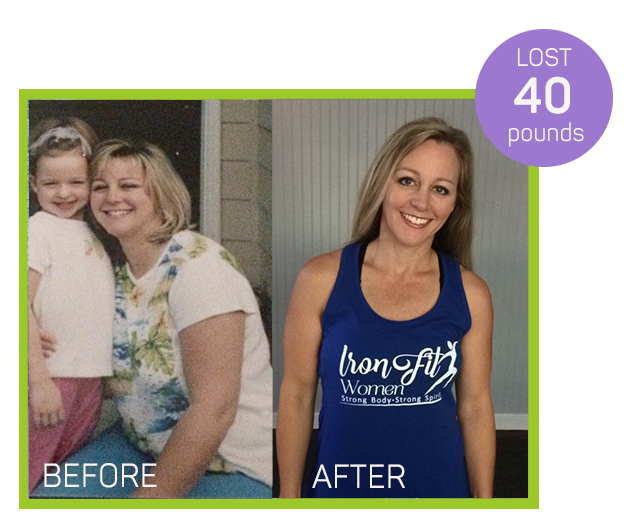 A big thank you to Angie for sharing your story with us. Keep up the wonderful work! YES U CAN!